Our range of products include Motorola FW200L Fixed Wireless GSM Landline Phone - Black, Panasonic Kxtg-3721sx Cordless Landline Phone ( Black ), Video Recorder, Digital Video Recorder, Dome Camera 1/3 and Dome Camera 1/3" Dis (digital Images Sensor),6 Mm 36 Ir. 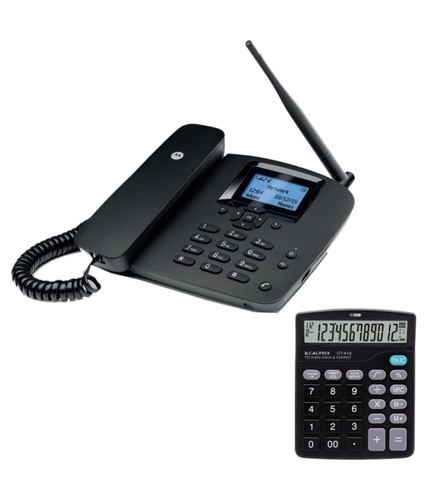 The Motorola FW200L Fixed Wireless GSM Phone is a land-line power packed with features. This phone comes with a 10 number redial memory feature that lets you conveniently dial any incoming calls you may have missed. It comes with a range of polyphonic melodies that you can choose from. Storing numbers on this phone is quite simple. The intercom and call transfer between handsets makes call management easy. Even though mobile technology has had a widespread impact as far as telecommunication is concerned, landline phones have continued to serve as dependable tools of telecommunication, from the domestic sphere to the professional. The Panasonic Kxtg-3721Sx Cordless landline phone is one such phone which is dependable and is laden with features that compliment the diverse needs and meet the dynamic purposes that communication comprises of in these times. With easy dialling features and a robust, ergonomic make that promotes easy handling, this cordless landline phone would be a prudent choice, if you have been looking for one. • High quality digital recording â€“ no tapes! • Includes 8 color infra-red dome cameras. 2) Wireless Security Solution with Network design.